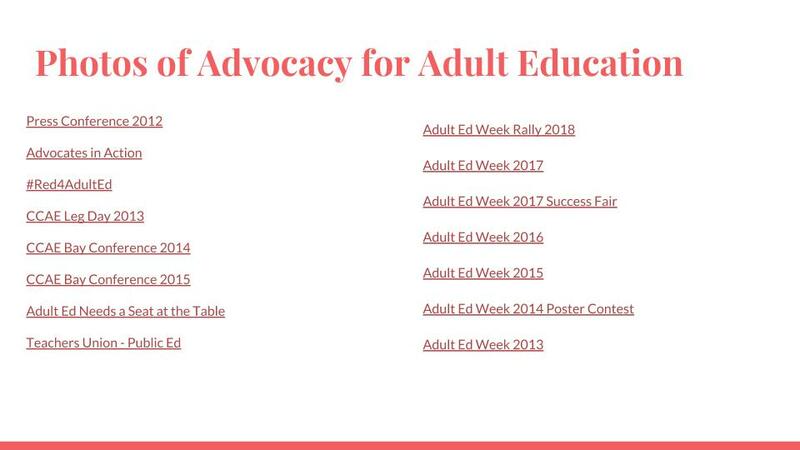 April 8 to 12 is Adult Education Week 2019. 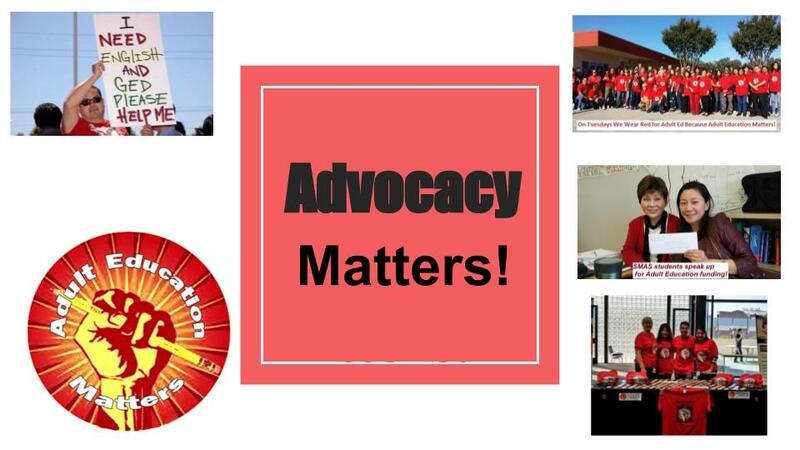 The focus this year is Advocacy. 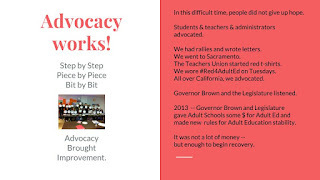 Here is a presentation to explain the power of advocacy and why we advocate for Adult Education. It's time to celebrate Adult Education! 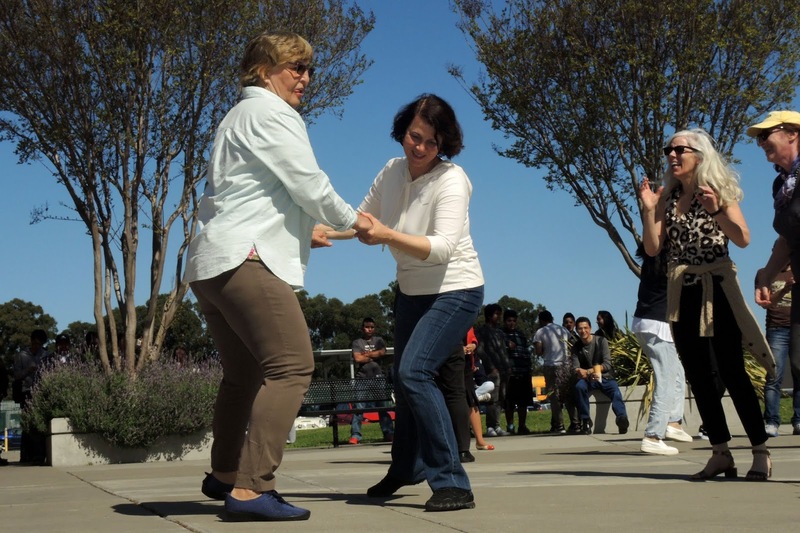 Every year in the Spring, California celebrates Adult Education. 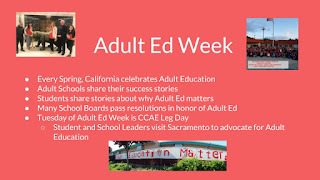 This year, Adult Ed Week is April 8 to 12. 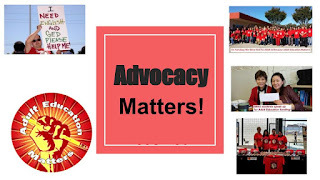 The focus is advocacy. The theme is "Our Voices Matter." 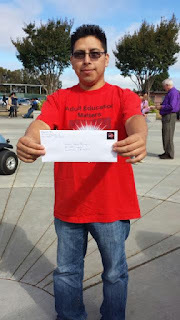 Adult Education gives us many reasons to celebrate. 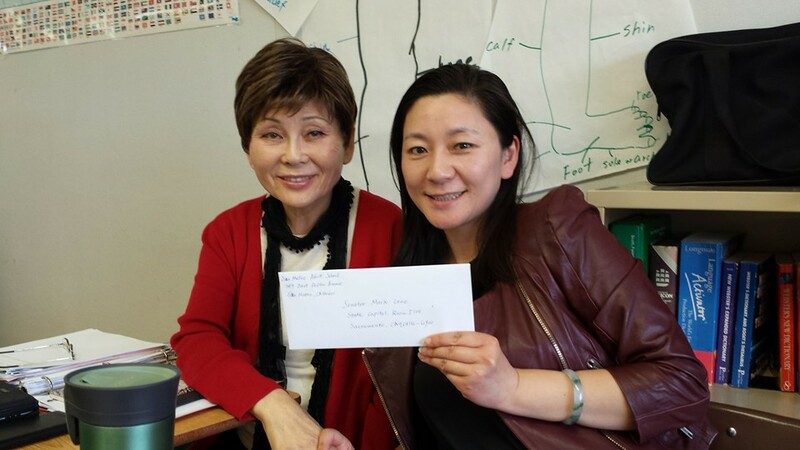 It provides classes to help immigrants learn English. It provides job training classes. It provides high school diploma and GED classes. 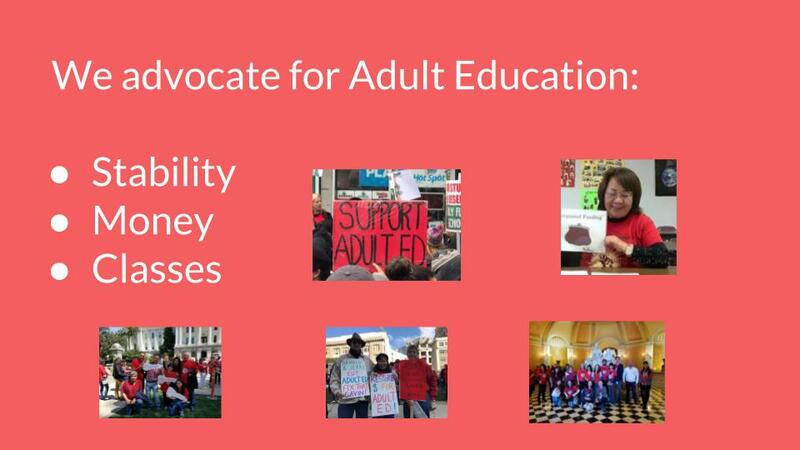 These are the reasons we advocate for Adult Education. 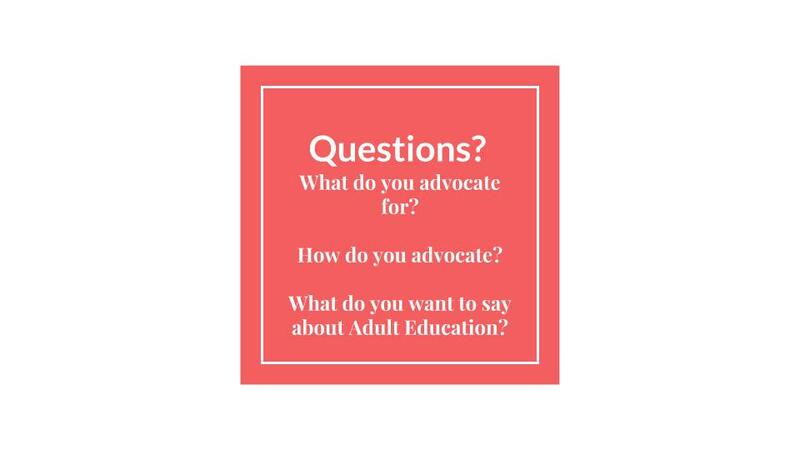 Adult Ed is so important. It helps many people. It helps California. 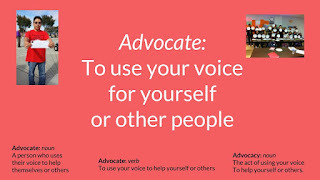 Through the week, classes will discuss advocacy. 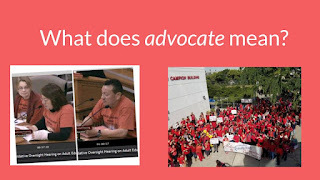 Teachers will share a special presentation about Advocacy. Marina and Cynthia prepared it and Student Ambassadors translated it into many languages. You can see the presentation in English here. Early Monday, Patty, Tommy, and Student Volunteers will hang the big Adult Education Matters banner. This tells everyone who passes by an important message: Adult Education Matters! Adult Education Matters banner hanging outside school. Two students painting part of the banner. We made this banner as part of Adult Ed Week 2016. On Monday morning, April 8th, at 10 am, we will do our traditional Virginia Reel. This is an old American dance, a kind of square dancing. Toshio will lead us. He will be the caller. He will call out the steps and we will follow. You can see a sample of the dance here. Student Council officers Shelley, Shereen, Claudia and Simone and Staff Members Patty and Cynthia will go to Sacramento for CCAE Leg Day. 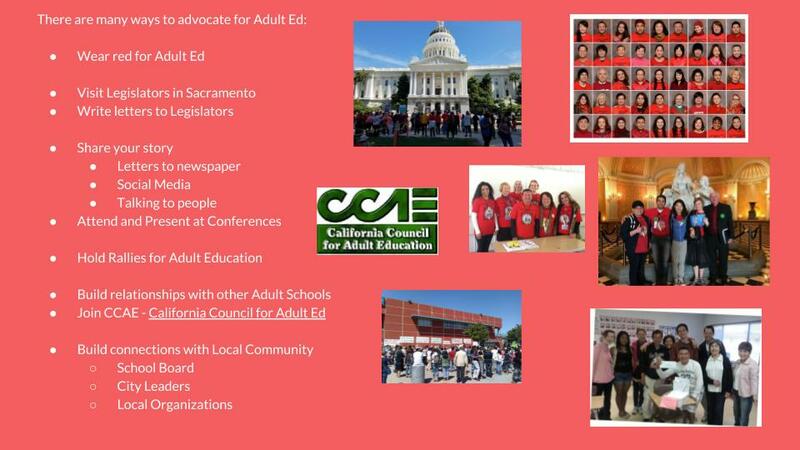 CCAE is the California Council for Adult Education. Leg Day is pronounced "Ledge" Day. It is a special day for advocacy. On this day, the SMAS team will talk to Legislators about Adult Education, our school, and the need for more funding for our school. 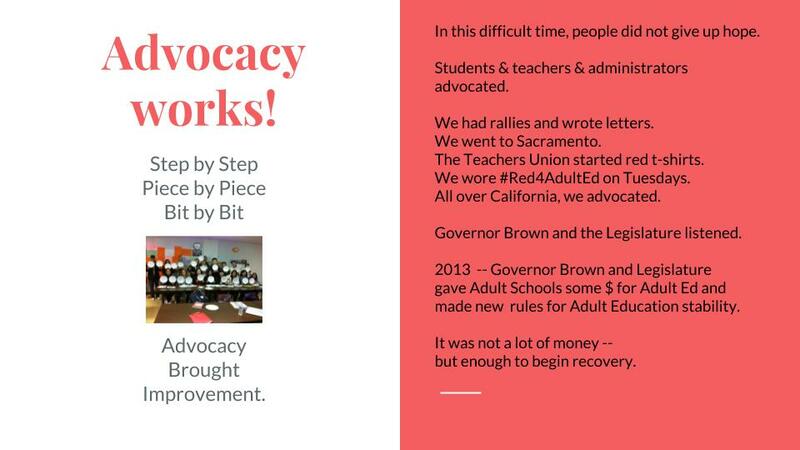 And remember, on Tuesday we wear #Red4AdultEd. 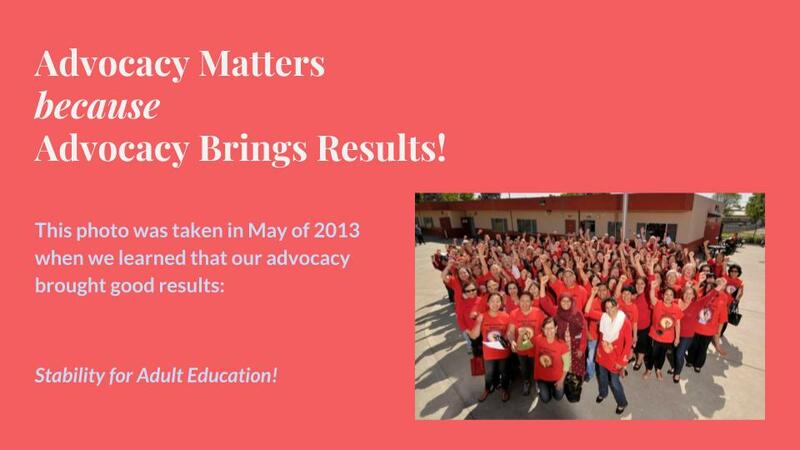 We do this to carry the message that Adult Education matters and show pride in our school. 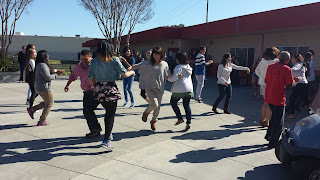 On Wednesday evening, Toshio will lead evening students in the Reel. Our school survived a very difficult time - when many Adult Schools closed and all Adult Schools were made smaller. We survived this difficult time by advocating for our survival. But our school - like all Adult Schools - needs more money. Adult Education has less money than before 2008 - when the economy crashed. This is why the focus for Adult Ed week this year is advocacy. We must speak up for our needs. Adult Education needs more money. With more money, Adult Education can help more people. This is important. 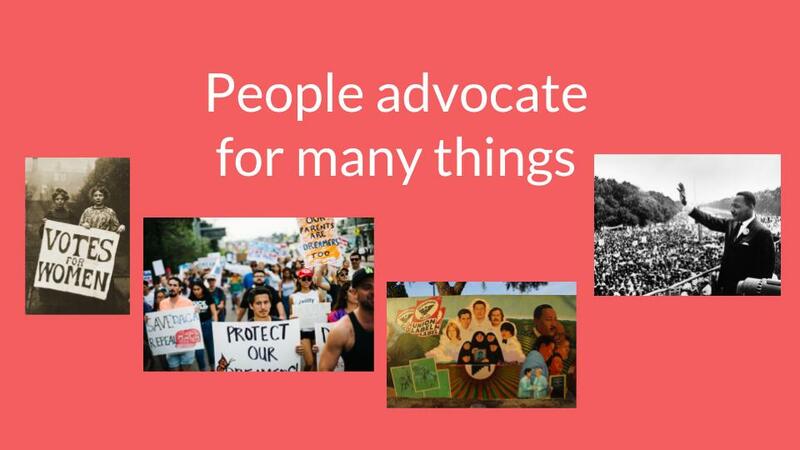 Our advocacy is important. 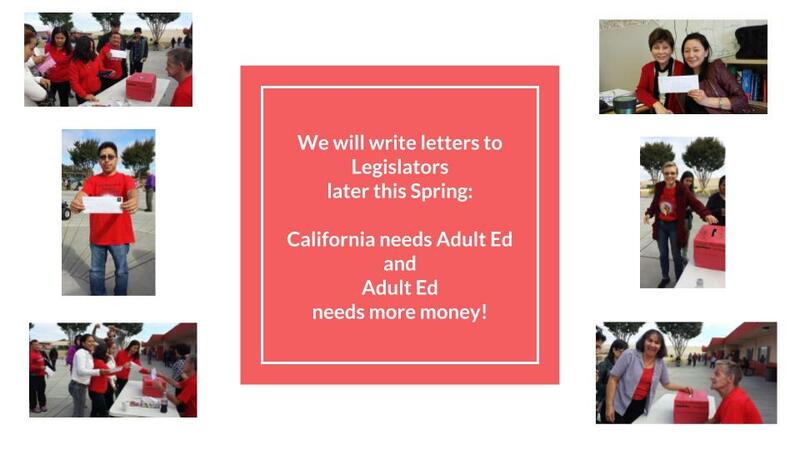 Later this Spring, we will write letters to legislators. We will use our voices to speak up and ask for what we need. Telling our elected representatives what we need is democracy in action. Our representatives depend on us to tell them what is going on and what we need in order to serve the people of California with the best Adult Education possible. So that is what we will do! 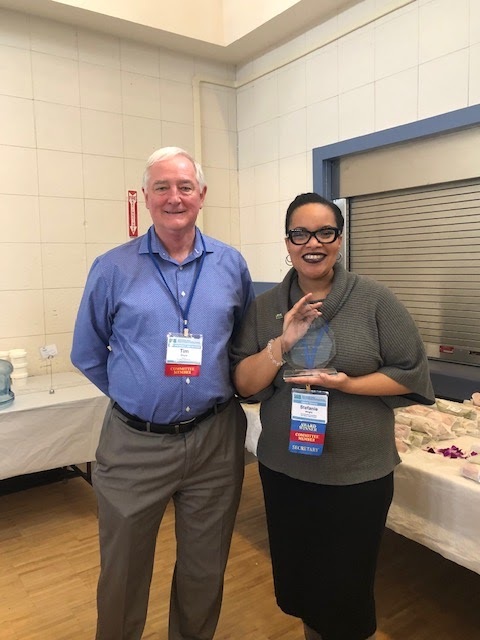 On Saturday, February 24th, CCAE - the California Council for Adult Education - Bay Section celebrated 75 years of CCAE - the diamond jubilee of CCAE. 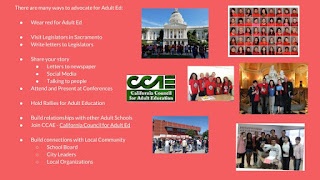 CCAE is an organization that is focused on Adult Education and Adult Schools. It is divided into sections. SMAS Assistant Director Eric Saavedra is President of the Bay Section. SMAS Administrative Assistant Stefanie Wright is secretary of the Bay Section. The sections have conferences every year. 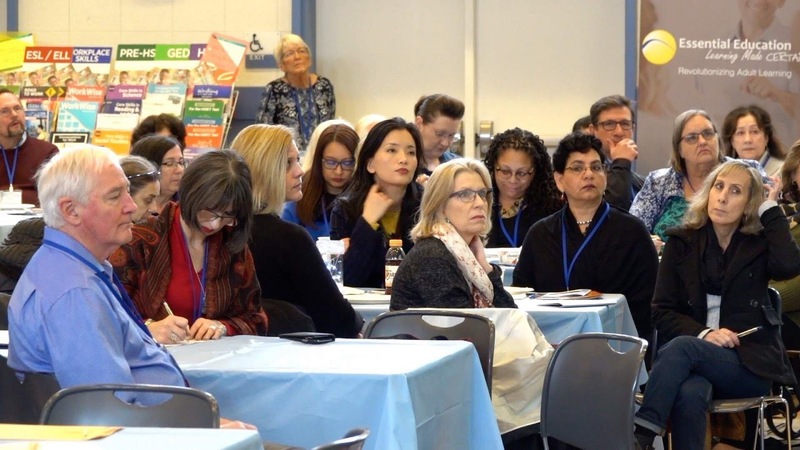 Everyone who cares about Adult Education - teachers, students, staff, administrators - comes together to talk about how to make Adult Ed the best it can be. Carlota and Stefanie worked with volunteers from SMAS and Fremont Adult school to prepare a delightful breakfast and lunch and decorate the tables in honor of the diamond jubilee. 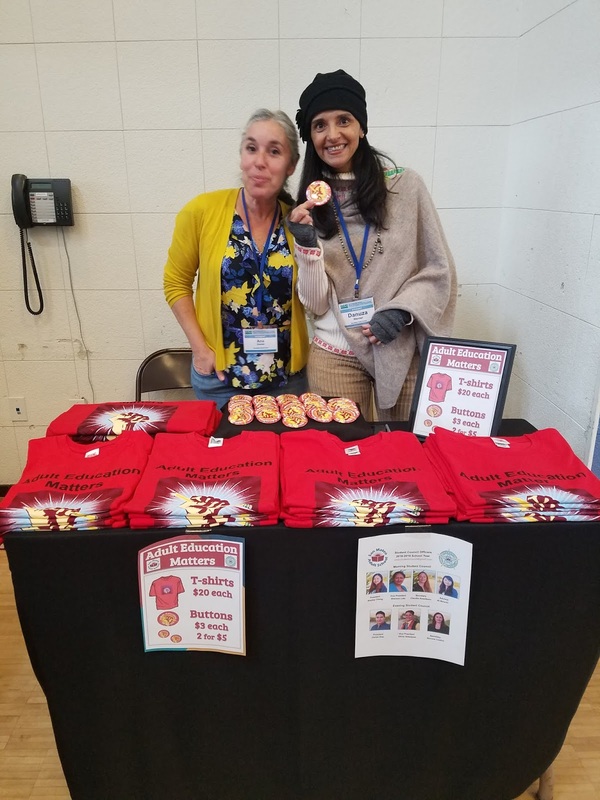 SMAS Student Volunteers sold #Red4AdultEd t-shirts, buttons, pencils and bumper stickers to carry the message that #AdultEducationMatters. 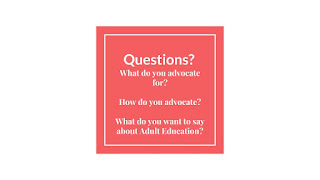 and the need to advocate - to use our voices - for Adult Education. Everyone must understand that Adult Education matters. 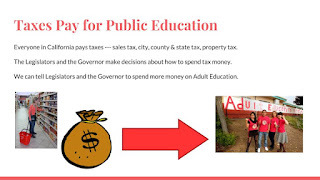 Legislators and the governor must understand that Adult Education needs more money. 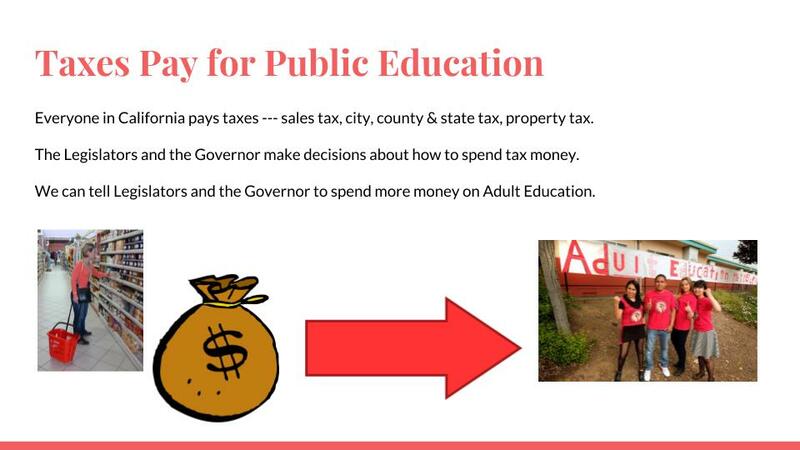 With more money, Adult Education can help more people in California reach their goals and create a great state. Patricia Brown for Excellence in Teaching. 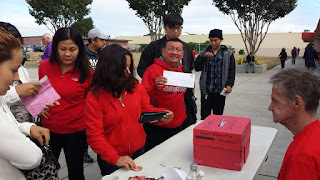 There was a raffle with many prizes and several SMAS students won. There were many workshops at the conference. Some topics were: advocacy, wellness, and how to be a good teacher. The SMAS Student Council presented a workshop about expanding opportunities for leadership. They presented their workshop twice and each time everyone loved it. Thank you to everyone who came together to create such a wonderful conference! 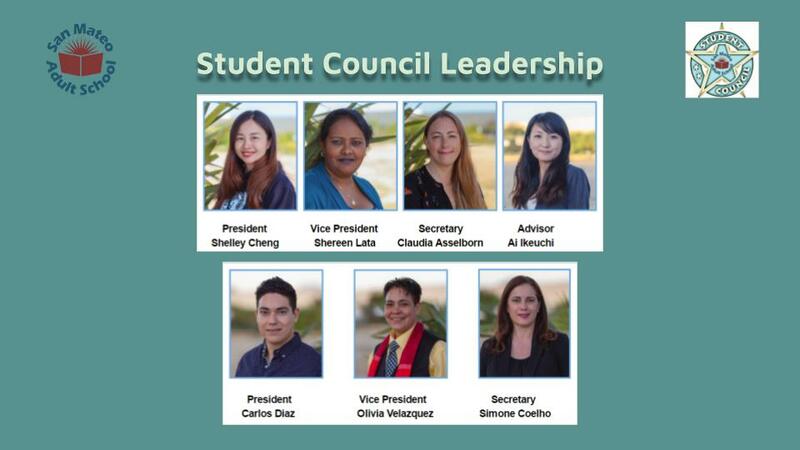 SMAS 2018-2019 Student Council gave an outstanding presentation at the CCAE 2019 Bay Section Conference. The title of their presentation was "Expanding Leadership Opportunities for Students." Here is Carlos Diaz's section about student council. Hello everyone! My name is Carlos Diaz. 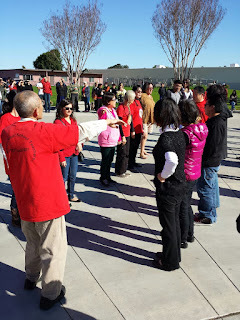 I am currently studying at San Mateo Adult School and am serving in the role of evening student council President. Today I will talk with you about the leadership opportunities the San Mateo Adult School student council provides for our student community. 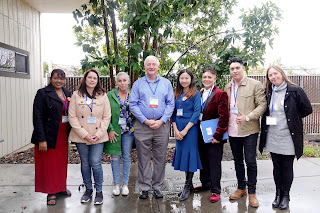 The San Mateo Adult School was formed more than 20 years ago and is a role model for student councils at the adult school. It is a form of government intended to integrated communications and decision making between students, faculty, staff, and administration to create a cohesive and informed school campus. The student council leadership is made up of the positions of President, Vice president, and Secretary. As an adult school, we have a unique situation in which we have both morning and evening classes at our school so we have two student councils, one for each, to represent the student population. 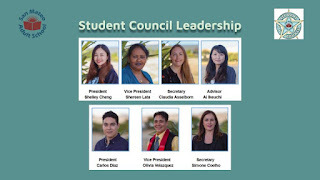 The process of electing student council leadership is quite similar to that of federal, state, and local government elections in the United States in which the people elect their representatives by voting for the candidates they feel will best represent them. At San Mateo Adult School, all students participate in the election process. What is the leadership opportunity that student council provides? You may be wondering, why is it important to have a student council? How will this improve my School? a commitment of responsibility and a willingness to represent others in their school community. It requires developing leadership skills by listening to others and organizing and carrying out school programs, activities and service projects. 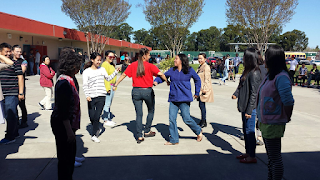 Student leadership is about creating a more harmonious and organized school environment. We are the voice of our classmates and we are tasked with motivating other students to take initiative and get involved. The student government advocates for adult education speaking with elected officials, community advisory councils, and presenting at conferences on the local, state, and national levels. and International Day and International Night. We also organize fundraisers to support people in our communities as well as in other countries where people have suffered the harmful effects of natural disasters. and the hurricane in Puerto Rico. 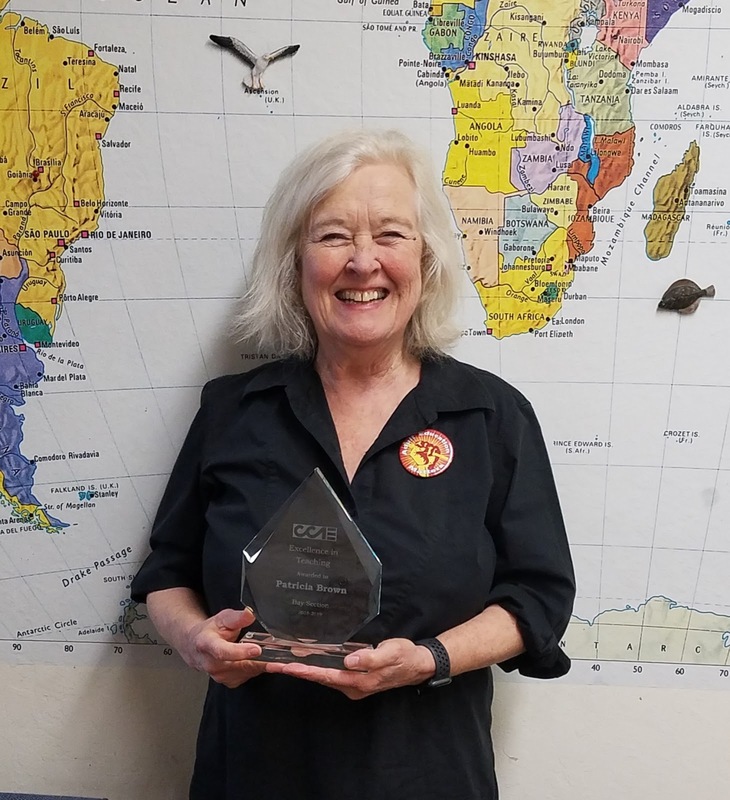 Most recently we held a fundraiser for the survivors of the devastating fires in Paradise, California. We are really proud of the generosity of our school community. And motivate others both within our school community and outside in the broader community. it never is too late to develop and get the knowledge and skills we need even if we are already adults. We believe that every student must be involved and have a voice in what is surrounding them at school, in their neighborhoods, and at home. 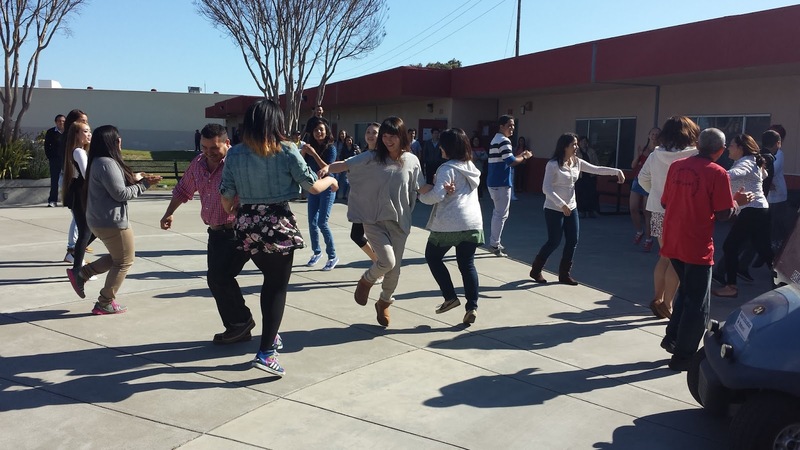 Student Council doesn’t just work at school, it is also a bridge into the community. Together we make great things happen at our school serving as role models of leadership for our own and other school communities. Now let me introduce Shereen Lata to talk with you about the Student Ambassador program. SMAS 2018-2019 Student Council gave an outstanding presentation at the CCAE 2019 Bay Section Conference. The title of their presentation was "Expanding Leadership Opportunities for Students." Here is Olivia Velazquez's section about student clubs. 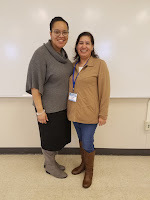 Hello Everyone, my name is Olivia Velazquez and I am a student at San Mateo Adult School and the evening student council Vice President. Today I will talk with you about how school clubs provide leadership opportunities for students. Leadership is when a person creates ideas for others to motivate them to do a good job. Every project needs to have a leader that will lead the group. This leader needs to listen to other people’s ideas, have a vision and share it with others. 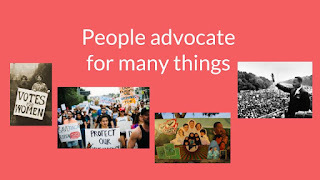 This creates a democracy in which all the people in the project have a input. 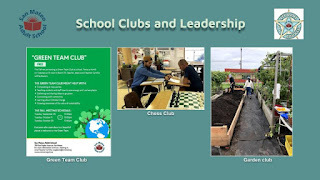 School Clubs provide students great opportunities to develop leadership skills, like Vision, Motivation, Service, Empathy, Creativity, Management and Team building. Clubs focus on a specific vision. This vision is then shared with others to help them get inspired to work towards a common goal. A good example of this would be the Green Team club at San Mateo Adult School. 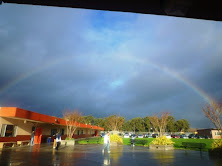 The Green Team club was established to help make our school campus more environmentally-friendly by composting at class parties, teaching students and staff how to save energy and use less plastic, learning about climate change, and more. Leaders of a club need to motivate the club members and get them excited to do their best to achieve the common goal. They need to make club members feel supported and appreciated. Club leaders need to have emotional intelligence and put themselves in the place of others to understand their concerns and help them solve problems. Good leaders need to create an environment in which the club members feel inspired to create new and better ideas. They need to guide and manage the club always reaching for the common goal. And, good leaders make the club members feel like part of the team. Student club leadership is necessary to help clubs distribute the tools and growth strategies for they require to function and influence others to join. 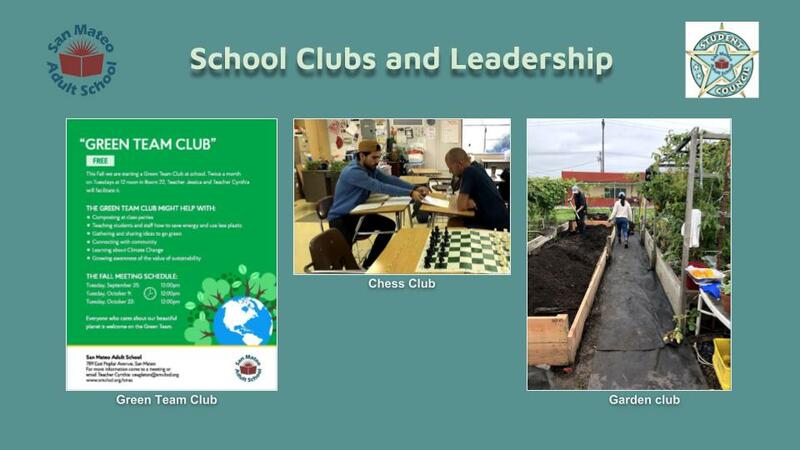 San Mateo Adult School clubs that offer leadership opportunities include the Chess Club, the Garden club, and the Green Team Club. 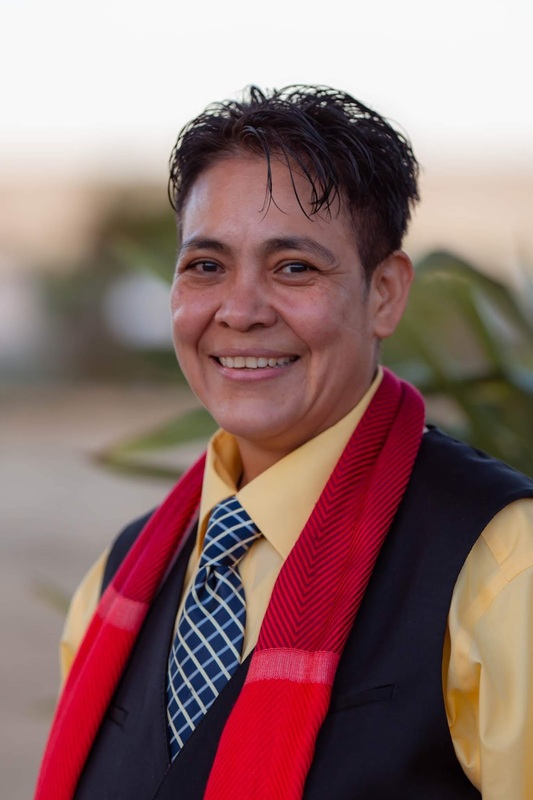 Now let me introduce Simone Coelho who will talk about leadership in Community Volunteering.